A healthy safe drinking water project was spearheaded by East Lansing Rotarian, Dr. Omero Iung. Through his leadership an international partnership between three Rotary Clubs – East Lansing Rotary Club, Lansing Rotary Club in Michigan’s Capital of Lansing, and Rotary Club General Camara of Rio Grande do Sul in Brazil was established in the Fall of 2013. The mission was to create healthy, safe drinking water in local schools from General Camara, Brazil. Both the Lansing and East Lansing Rotary Club’s donated $2,500, for a total of $5,000 towards the project plan of purchasing and installing 10 drinking fountains. 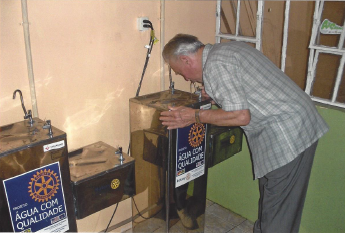 The Rotary Club of General Camara took responsibility for acquiring, installing the fountains and educating the community on water preservation. In October of 2013 the funds were received from the United States. 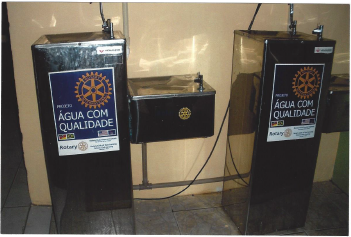 Due to the favorable exchange rate of the dollar to reais, Rotarians of General Camara were able to acquire one additional drinking fountain. It is estimated that 1,500 students and 500 teacher, staff, administrators and visitors will enjoy the benefit of consistently delivered healthy and safe drinking water. In addition, the local Rotary Club coordinated talks by experts on the importance of water preservation and the rational use of water with the expectation that those messages would be carried home to families and communities. Dr. Omero Iung sampling the drinking water. Congratulations to all Rotary partners for a successful project completed. On January 13th 2012, the world will reach a remarkable milestone in the fight to eradicate polio – 12 months without a single case of polio for the first time in India’s history. It’s a remarkable achievement: and one that many thought would never be possible. One of only four remaining polio endemic countries in the world, India has battled to get the upper hand in the fight against polio. As recently as 2009, India recorded the highest number of polio cases in the world. Many said it would never stop the spread. But since then, nationwide collaboration has changed this story.